Do you like Princesses? 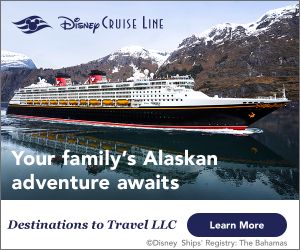 Do you like Walt Disney World? The two really go hand in hand. So can you guess what our topic is this month? You got it, a Princess at WDW. That sounds so cool. AND, since this is the month of the 4th of July, we thought we’d add in some good old Red, White and Blue. Come on, let’s celebrate Princesses at WDW and America! 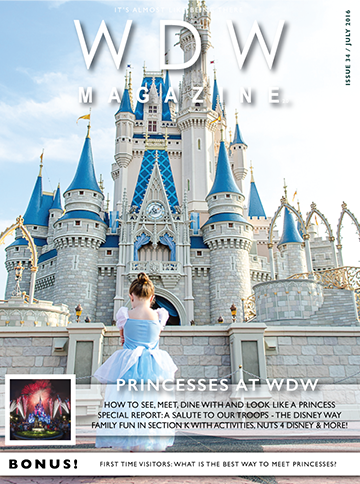 Our Feature articles this month talk about how and where to meet Princesses. How to dress like a Princess and the shows with Princesses in them. Pretty much everything you need to know about the Princesses at Walt Disney World. Our Helping Hands section starts out with a look for first time visitors about how the best place to meet Princesses are at dining experiences and meet and greet areas. All little girls like to dress like a Princess so we take a look at how and some of the new rules. Then we look at Bibbibi, Bobbidi Boutique and how to get beautiful like a Princess. We cap Helping Hands off by taking a nice relaxing surrey ride around the Port Orleans Resort. This month in the Best of WDW we head over to the Coronado Springs Resort for the 10 Reasons We Love the Coronado Springs. The restaurant of the month is Skipper Cantina, the attraction is Colortopia and the gift shop is Castle Couture. The FanZone is a little funky this month. It kicks off with a poll about, what else, Princesses. Then we get a little funky as we find out how to make Tye Dye Cheesecake like that at Everything Pop. We have the monthly Photo Contest and our Vinylmation and Tsum Tsum Corners that look at… Princess Vinylmations and Tsum Tsums. This month is a big month to celebrate America so we thought we’d join right in with a look at the military salutes around Walt Disney World. We kick off with a look at Walt Disney’s history with the military. It’s pretty cool. Then we head over to Shades of Green and look at Disney’s hotel that for active duty and retired military. Then we look at the Flag Retreat in the Magic Kingdom. Very special. Oh and there might be a fireworks picture or three. Section k! is all about the kids and boy is this month’s line up fun. First, Wally D is back and having fun at WDW. Then the Parks are still over at Epcot having fun with their new friend. Bring the Magic Home wraps up our runDisney series as we learn how to make Princess costumes to run in. How cool is that? Finally we have our download package that has coloring pages, games, puzzles and more. The last section each month is one of the best. Yes, we do save the best for last. Around the World kicks off with a look at all the News from WDW. There sure was a bunch of that. Next comes The Little Things and a look at the 4th of July. Boom. Our Did You Know finishes up the look at frozen (little f) treats around WDW. Then we look at the history of Maelstrom which is now called Frozen Ever After. And finally, we take a little road trip over to Discovery Cove. How fun. Another full issue of great information. I think you’ll like it.